Plan your visit to OperaDelaware and the Spring Opera Festival at The Grand! Get information on travel, accommodations, area attractions, restaurant suggestions, and more. Your experience is important to us. Here is some helpful information to get the most out of your visit. If you have a specific question or need help planning your visit, please call the OperaDelaware office (302-442-7807) and talk to our staff. We are happy to help! 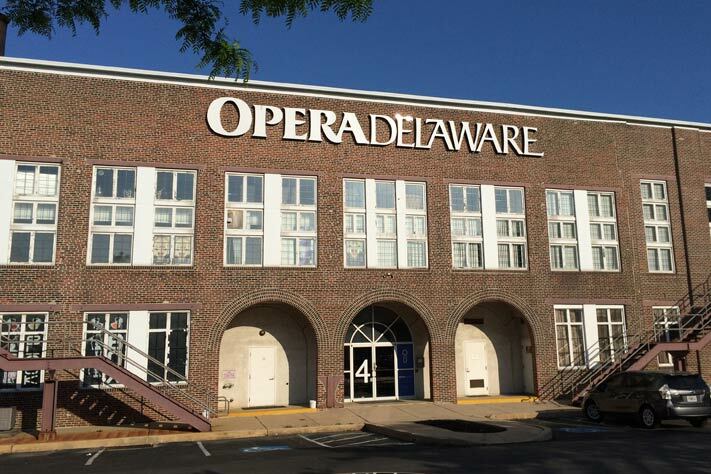 OperaDelaware is located in beautiful Wilmington, DE, which is just a short trip from major cities including Philadelphia, Baltimore, New York City, and Washington, D.C. For travel by car, Wilmington is located just off I-95, I-495, I-295, and the New Jersey Turnpike/Delaware Memorial Bridge. For travel by train, both Amtrak and SEPTA make frequent daily stops at the Downtown Wilmington train station (WIL). For travel by plane, the Philadelphia International Airport (PHL) and the New Castle County Airport (ILG) are about a 20-minute car ride from Downtown Wilmington. CONCERTS & RECITALS AT THE OPERADELAWARE STUDIOS: The OperaDelaware Studios are located at 4 S. Poplar St., Wilmington, DE 19801 on the Christina Riverfront. PARKING: There is ample parking in the lot located directly in front of the Studios. Overflow parking is available on Front St. If you are traveling to the OperaDelaware Studios, please be advised that there is currently road construction on Martin Luther King Boulevard in front of the Wilmington Amtrak station, so you may need to follow a short, clearly-marked detour depending on your route. This 3-minute detour will take you across the Christina River, where you'll then make a left on A Street, and another left to cross the River again to get back to the OD Studios. (See map.) If you have any questions or concerns about the detour, please give us a call at 302-442-7807. FOR PERFORMANCES AT THE GRAND: Our mainstage Festival performances take place at The Grand, located at 818 N. Market St., Wilmington, DE 19801. From points north, follow I-95 South to Exit 7B toward DE-52 N/Delaware Ave. Take a left onto Delaware Ave. In 0.3 mi turn right onto N. Market St. The Grand Opera House is located on the left. From points south, follow I-95 North to Exit 7 toward DE-52/Delaware Ave. Take a right onto 11th St. which merges onto Delaware Ave. In 0.3 mi turn right onto N. Market St. The Grand is located on the left. For a printable map with directions, please go HERE. There is also garage parking available at the nearby DoubleTree Hotel (King St. and 8th St.), the HyPark garage (903 N. Shipley St.), and the Mid-town Park Garage (820 N. Orange St.). Please check with garages for hours of operation, as they are subject to change. WHERE TO STAY: There are several hotels in downtown Wilmington within walking distance to The Grand, including the DoubleTree by Hilton Downtown Wilmington, the Courtyard Wilmington / Downtown by the Marriott, the historic Hotel du Pont, and the Sheraton Suites Downtown Wilmington. For a full listing of area hotels, please see the Greater Wilmington Convention & Visitors Bureau website. In Wilmington, Delaware, and the Brandywine Valley, town and country have never been closer. Drive only a few miles from the meetinghouses and courtrooms of downtown Wilmington, and you'll be able to hear the hum of the city quickly give way to the quiet of the Brandywine Valley, a place where countryside estates and gardens have been carefully preserved for more than a century. The best of both worlds co-exist here like nowhere else, and a visit means never having to choose one over the other. See Wilmington & the Brandywine Valley from a new perspective! Drive just a few miles north of Wilmington to wander through the breathtaking public gardens that have made the Brandywine Valley an international tourism destination. LONGWOOD GARDENS has grown into one of the premier botanical destinations of the world, with more than a thousand acres of indoor and outdoor gardens, woodlands, meadows and majestic fountain displays. Today, Longwood boasts more than 11,000 different types of plants and trees, hosts 800 horticultural and arts events each year, and welcomes more than one million visitors annually. As time allows, we also encourage you to take a tour of the house and spectacular 60-acre garden of WINTERTHUR MUSEUM, GARDEN AND LIBRARY. Winterthur’s preeminent collection of American antiques reflects both early America and the du Pont family’s life at this glorious estate. NEMOURS MANSION & GARDENS is where a visitor might believe he or she magically just stepped into Europe. Modeled after Versailles, Nemours is a masterpiece of design with its mansion, fountains, artwork, gilded sculpture and what is reputedly the largest formal French garden in North America. Don’t miss the many museums and galleries in Wilmington, where decades of community commitment to the arts are on display every day. Several masterpieces of Brandywine Valley native Andrew Wyeth hang inside the halls of the BRANDYWINE RIVER MUSEUM OF ART, while THE DELAWARE ART MUSEUM is renowned for its collection of American art and illustrations featuring Wilmington-born Howard Pyle, as well as its exquisite and extensive collection of English pre-Raphaelite paintings. Down on the Riverfront, the THE CONTEMPORARY showcases exciting work by emerging artists. For more more information about all that Wilmington has to offer, visit the Greater Wilmington Convention & Visitors Bureau helpful website, visitwilmingtonde.com.